Doug and I don’t get much couple time anymore… unless you count TV after dinner… until one of us conks out… and that would be him. Sometimes I arrange for a caregiver on Saturdays. Typically we’ll spend that day working on the never-ending projects at our old house. And that’s OK with me. It’s a day together. I appreciate that which I took for granted for so long. 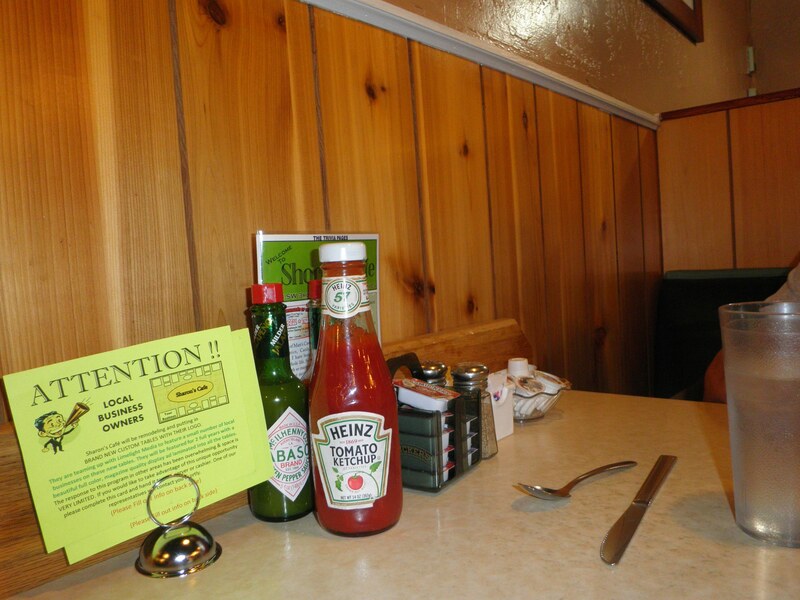 We’ve also gotten into the habit of stopping for breakfast on those Saturdays… at Sharon’s Cafe. Recently our server commented, “your order won’t take as long as last week”. Which means she’s beginning to recognize us as regulars… and it feels kind of nice to be a regular… to be remembered. Every time we pull up to Sharon’s though, I see us eating pancakes in Alaska, with my father-in-law. The rest of the details are a little sketchy. This time I mentioned it to Doug. And there it was…Teeland’s Corner, Wasilla, Alaska… the Parks Highway… straight ahead to Fairbanks… left to Knik Road… right to Fishhook Road… the road we lived off… somewhere in the woods. We always lived somewhere in the woods. The little café is probably long gone… we’re talking ancient history here. Cliff made several solo trips to Alaska during our early years there. He briefly owned a piece of property near us… he joined Doug for a moose hunt… and he even worked at Prudhoe Bay for a while. Wherever we lived was his temporary home base. And on Saturday mornings we went to the Pioneer Café for breakfast. He always ordered a short stack of pancakes, although he called them flapjacks, and coffee. He enunciated “f-l-a-p-j-a-c-k-s” slowly, deliberately… I think he just loved the sound of the word. When his flapjacks arrived, they were buttered, stacked and cut in straight, even rows… then crosswise in perfect little squares. He carefully drizzled maple syrup on one small section at a time. No soggy flapjacks for that man. It’s interesting how we associate place with people and life events. Maybe that’s how our memory keeps it all tucked in and held together. For example, I’ve flown into Sacramento Airport more times than I can count. And until recently, the same two people stood at the bottom of the escalator, right next to baggage claim, waiting for me… my Mom and Dad. They don’t drive anymore. And the next time I fly into Sacramento I know they won’t be at the bottom of the escalator… but I’ll still see them standing there. It turns out, aside from the fact he had changed his breakfast preference, she used to wait on him at the small café he frequented here. “He was funny… thanks for the memory jog” she laughed… “I just loved that man”. Rich memories – simple times, but full of riches. Makes me want to savor each moment (and go make some f-l-a-p-j-a-c-k-s). Love the picture of him cutting them carefully, precisely. Life has its wonderful moments. It’s usually those everyday moments that we recall with such fondness. In sharing your memory, it triggered one of mine… also a flapjack moment in the restaurant of a northern town, but in Whitehorse, Yukon not Alaska. Our 20-something daughter was with us and decided on “pancakes” for her breakfast. She ordered “a stack”, but the waitress hesitated and asked if she was sure she wanted that many. When told that was “three”, DD confirmed the stack. She usually had at least three at home. Still the waitress hesitated. “They’re pretty large,” she said. When asked how large she gestured to indicate dinner-plate size and added, “We have a policy here. If you can eat three your meal is free.” DD ordered one and had trouble finishing it! Some memories are funny, others poignant. So sorry I got behind with my reading… glad I checked back because I love your pancake story, Carol. That triggered other memories of ordering something that looked delish on the menu and being overwhelmed at the size… or smallness 🙂 It really is the everyday moments that make life so rich. Hey, Cliff & I have something in common…..I am not a fan of soggy “flapjacks” either. I either drizzle & scarf them down as fast as I can to avoid the sogginess, or I add a little at a time too. — Now that I think about it, I wonder if that’s the reason Robert eats his pancakes DRY…no syrup at all. Maybe it’s not that he doesn’t like syrup, maybe he doesn’t like the sogginess. … Now I’ll have to ask him. I did not know that about you or Robert!! Fun memories.